~ The Chantylace Collection of Antique Irish Lace. 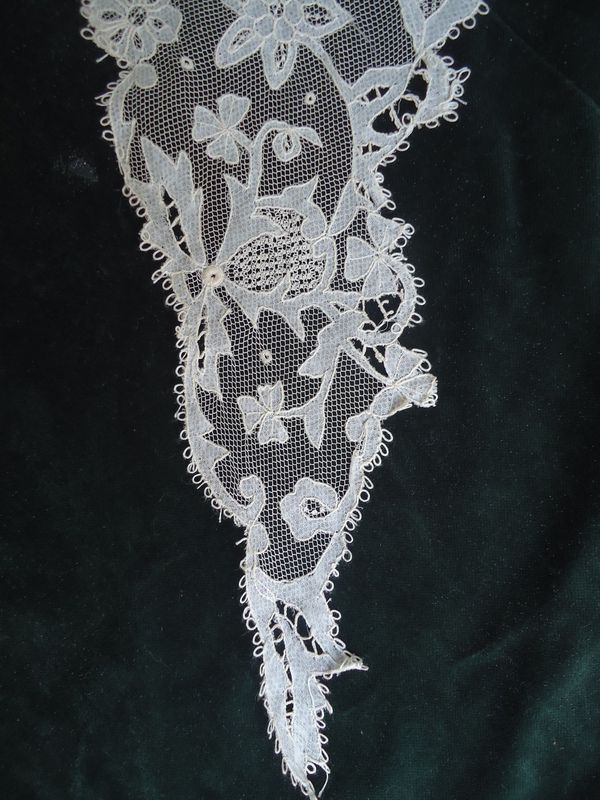 T he first Irish Lace to be made using machine-made Net as a base was Carrickmacross. It was made with a sewing needle & very fine cotton muslin embroidered & appliquéd onto the net. There are two types – Appliqué & Guipure. Appliqué is made by tacking fine net & very fine muslin. The muslin has to be fine enough to allow the pattern to be seen through it, over a design drawn on paper. The design is then outlined with a thick thread & couched down into position, through both layers of fabric with a finer thread. The excess muslin is then cut away around the outline of the design. 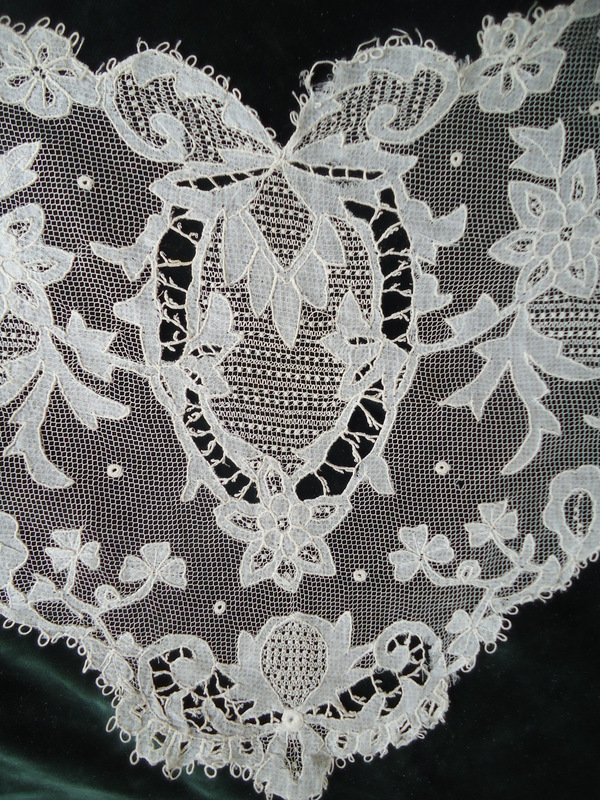 The exposed net is then decorated with different filling stitches, very similar to those in Limerick Lace. Guipure is made by tracing the outline of the design with couched down cord on cotton or cambric (a very fine Linen cloth), no net is used, and again the excess is cut away. The finished Lace is always edged with tiny little loops & then when complete it is detached from the pattern. Flowers, Shamrocks, Pops & Dots are the main features of its designs. In 1816 Margaret Lindsey married Rev. John Grey Porter of the Church of Ireland at Donaghmoyne in County Monaghan, just about two miles from the town of Carrickmacross. The couple went to Italy on their honeymoon in the year of 1816. In Italy she saw Laces & Appliqué, and saw many local Lace-makers making the craft. She brought many beautiful examples back to Ireland with her. Inspired, and with the help of her sewing maid, Anne Steadman, to figure out the Appliqué techniques, she decided to take the Lace apart to see how it was made. From that they tried to replicate it, but instead of replicating it, she created an entirely new type of Lace. It was just called Appliqué. Mrs. Grey Porter, like other ladies of her class, saw in the craft a way to provide much needed employment for young women in rural Ireland. In about 1820, they established an Appliqué Lace-making class which soon attracted a number of young women. Mrs. Grey Porter and her family (six children), lived in the Carrickmacross area, first in Kilskeery and then later in Clogher Park. Rev. Grey Porter was very affluent and owned a very large amount of property around the North of Ireland. When he died in 1873 he left his whole estate to his son and heir, John Grey Vesey Porter. His Landed properties consisted of Clogher Park, Belle Isle Castle & Kilskerry. The condition of his will stated that his widow Mrs. Grey Porter should enjoy Clogher Park for the rest of her life, together with the very large annual sum of £3,000 a year. She lived there until her death in 1881. After her Introduction, the Lace-making craft prospered, though there was a small decline in production in around early 1840’s. T hen in 1846 the Lace-making schools made a great contribution to the survival of many families. In the period of the Great Famine, the Monaghan area around Carrickmacross was particularly affected. It was the contribution of Miss Read who set up Lace-making classes on the Rahans Estate. She established it in an outhouse first, with the classes confined to tenants on the Estate. She used copies of Mrs. Grey Porters patterns for the classes and as the venture proved successful and profitable, they eventually had a special building built for the Lace-making Classes at Cullaville, nearby. Other very important undertakings were achieved at the Lace Schools in the Bath and Shirley Estates, also established in around 1846 by Tristram Kennedy (1805-1885, Layer & Politian, MP for County Louth, and responsible for the Revival of Irish Legal Training in1835). He also managed the Bath Estate for the Marquis of Bath. He obtained a Privy Council Grant of One Hundred Pounds to assist in building seven Lace-making Schools on the Estate. He was in partnership with Captain Morant the Agent of the nearby Shirley Estate. The Shirley’s were absentee Landlords and spent most of their time in Ettington, Warwickshire in Engalnd. They set up the Central School in a house in Carrickmacross town from which the Designs, Instructions and orders for work were sent out to the other seven Schools. 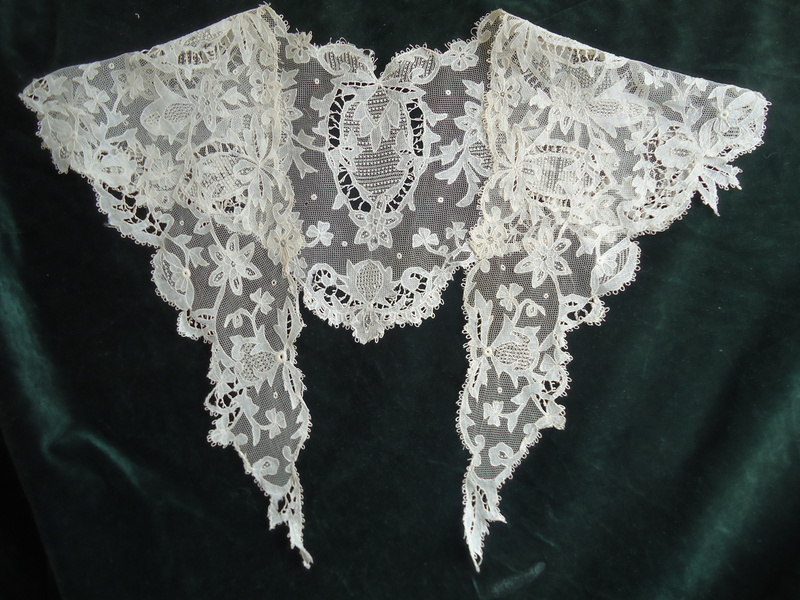 This type of Lace was only known as either Appliqué or Guipure up until the Dublin Exhibition in 1872, where the type of technique was named after where it was made. Thus it became known as Carrickmacross Lace. Carrickmacross Lace would have been sold in The Royal Irish Industries Depots and other Lace Outlets, one to note was Robinson & Cleaver of Belfast and London, they were Linen Manufactures, it was reported that at the Paris Exhibition in 1889, Robinson & Cleaver had a large array of Carrickmacross Handkerchiefs.